In case you were wondering about one of the finest watch-making companies out there ,here is a Top 10 about the Most Expensive Breguet Watches! The luxury watchmaking company was founded by Abraham-Louis Breguet in Paris in 1775. The company is known to be one of the oldest in the timepiece business. Breguet also managed to leave its mark in the world of timepieces by pioneering several technologies that later proved to be of crucial importance. For example, Breguet invented the tourbillon escapement. The company is also the manufacturer of the first wristwatch released in 1810 which is today owned by Swatch. Because of his inventions and innovativeness Monsieur Breguet is known as the “father of watchmaking”. As the fame of his watches rose among important people so did the price of his magnificent work. Here is a top of the company’s most impressive and expensive work! As you can see this is a ladies watch which features an oval case made out of 18 karat white gold. The sapphire case-back is transparent letting you see the beauty of its mechanism. 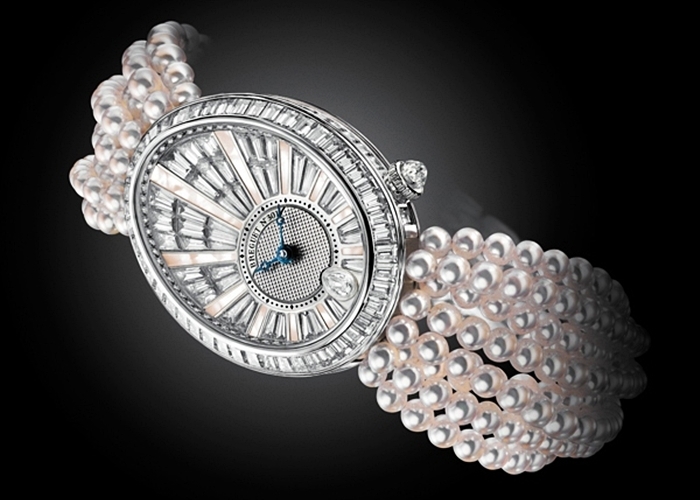 Reine de Naples wristwatch is adorned with a total of 138 baguette diamonds placed on the case-band set and chapter ring. At 6 o’clock the Reine de Naples has a single pear-cut diamond and the bracelet of the watch consists of natural pink Akoya pearls from Tahiti. And on top of it all, the watch is water resistant. It can handle the pressure just fine at 100,000 ft under water!